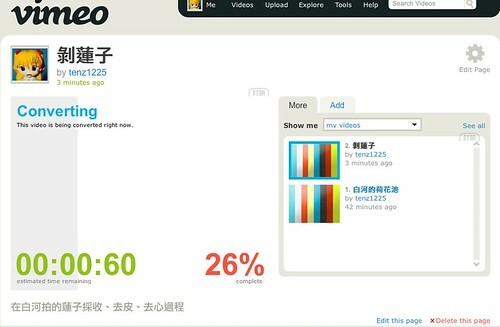 剝蓮子 1280×720 from tenz1225 on Vimeo. This entry was posted in internet, 亂寫隨筆, 推薦網站, 試用報告 and tagged video sharing, vimeo, web2.0, youtube, 影片分享. Bookmark the permalink. 我是用 Mac 上的 iMovie 08，可以直接支援 AVCHD 格式，不用裝任何解碼器，USB 線插上，影片片段抓進硬碟，就可以進行後製剪輯和轉檔輸出了..